The Krunk Bunk- Not yet finished- Its 4' high, 4' wide, and 8' long, and designed to be fairly easy and affordable to build. This is just a temporary installation, as my finished basement is so small, but I'm going to regret having to take this down after we later shoot the rest of an episode on it- its comfortable- and fun! 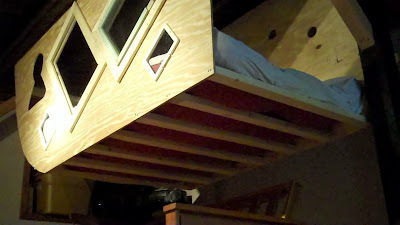 "THE KRUNK BUNK"- Its a tiny sleep/work chamber for studio apartments, city lofts, and small spaces in general- and was a project we undertook to exemplify small space efficiency. It HANGS from the ceiling, as opposed to most other bunks and micro-lofts that have legs (which often limit what you can do, store, place below them). It would be best suited in a high-ceiling environment, but we placed it here for the sake of demonstration- in a setting not perfectly ideal (but it was all we had for space in my small home). 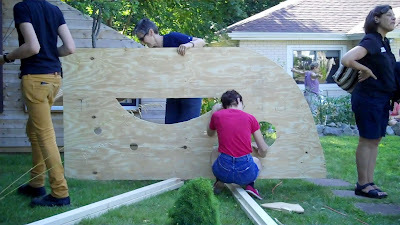 THIS is also ONE of two structures we built as groups two days ago in our workshop- 14 HOURS LONG- man, were we all tired by the end. We'll soon post photos of the group project that my brother Dustin led, as well- and MANY others....(NOTE: This structure is NOT finished yet, and will be added to, painted, decorated, and further tweaked/trimmed- AND will most likely appear (along with those who helped) in a future edition of "Tiny Yellow House" TV- a Make Magazine edition! 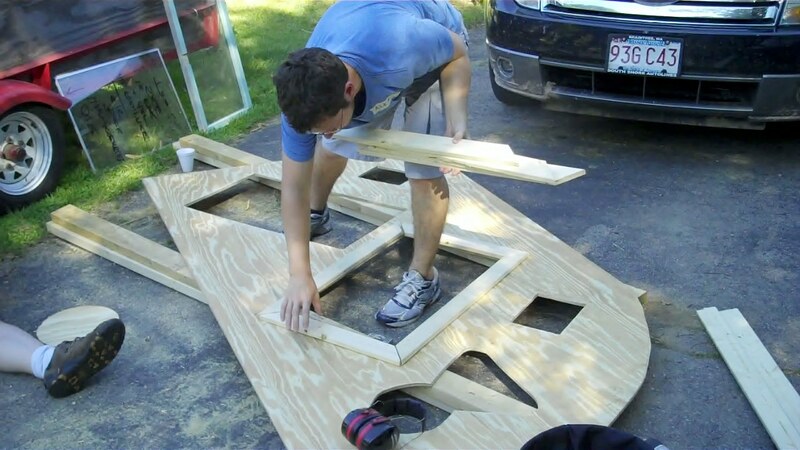 We still have to build a mini-ladder to it as well. The Krunk Bunk is one of the designs I had/have in my 34 page zine/packet "Quick Camps and Leg Cramps" that I'll soon be having up for sale (the remaining copies from loooong ago). And thanks to the 22 heads who took part in our first annual Relaxshacks.com Tiny Shelter/House Hands-on workshop in Stoughton, MA. The ages ranged from 15, to early 70s- and it was a great, very intellectual, mix of all-around good people. We had FIVE of my mini cabins on display, The Whittled Down Caravan rolled into town for a show n' tell, solar showers and cookers, a sawdust composting toilet, and we had speaking sessions from Mimi Zeiger (who came from NYC), Alex Pino (from Florida), and Dustin Diedricksen. I personally had a great time too, and there was a great wealth of ideas, and background/experienced-information being passed around all day. We will have another down the road. In the meantime, check out the other photos. PS- Alex Pino, from Tinyhousetalk.com was THE FIRST to test out The Krunk Bunk- and spent a night in it, in fact.... One other student, Forest Zoll, our youngest, spent the night in The Gypsy Junker, as well- and loved it. This photo is a little deceiving- its taken from my micro closet office ("cloffice"). 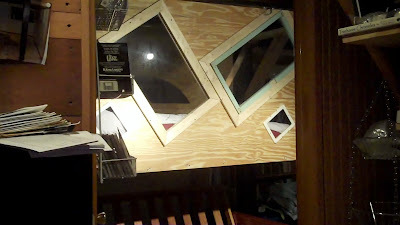 The side of the bunk is about 6-7 feet away, but in this photo it appears to block any exit from the office! AGAIN, More photos (of Project #2)- coming soon. And again, thanks to all who attended the workshop! 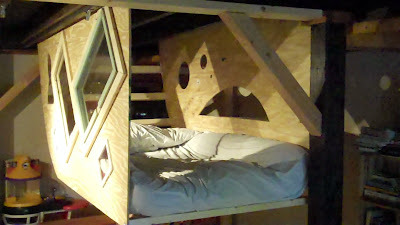 Soonish- since I just don't have the room to keep it, The Krunk Bunk will be up for sale. Proceeds will simply go towards shooting more how-to/educational videos for our show "Tiny Yellow House"- and paying for materials to build those new structures.If interested- kidcedar at gmail dot com. Again, my NEW, EXPANDED (new designs, color photos, guest contributors) edition of my tiny house/home/space design book "Humble Homes, Simple Shacks" is out at a discounted pre-order price right now....just click on the link above. Its only $11.53 (a random price, I know...). A few, older, signed, hand-assembled, copies of the book are still for sale in the right hand column of this site too- those have several designs that WILL NOT be in the new edition. So the two books WILL have several differences. The new book is sort of a Version 2.0.